Competitive tournament tennis players in South Florida have the unique opportunity to take part in the first ITF/USTA collaborative tournament right in their own backyard. 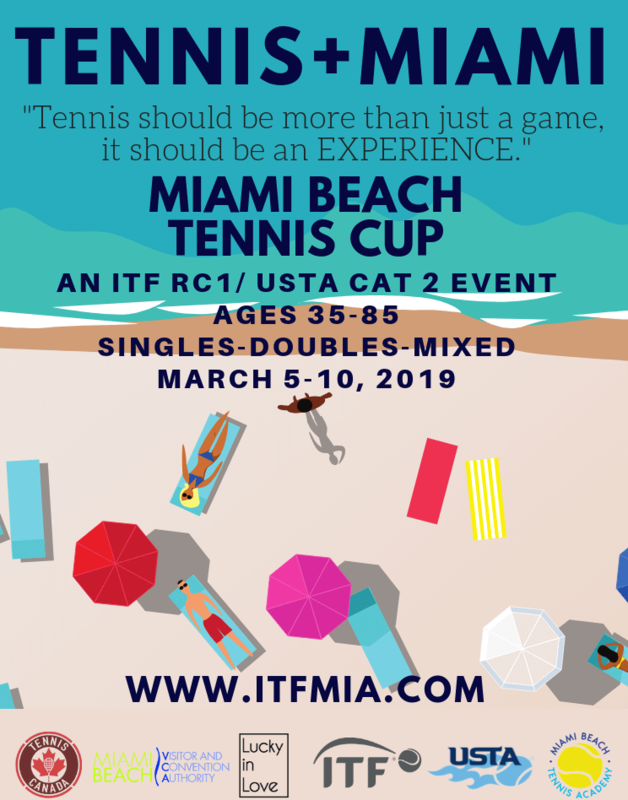 The Miami Beach Tennis Cup will take place March 5-10, 2019, when men and women ages 35-85 will compete in singles, doubles and mixed doubles at the newly-renovated Miami Beach Tennis Center, home of the 2018 and 2019 ITF Young Seniors World Championships. For the first time this regional tournament is open to players from all over the world and offers USTA Cat II and ITF RC1 ranking points. No ranking is necessary to enter. The ITF also upgraded key Category I National Championships and Super Category II adult tournaments in the United States to Grade A and Grade 1 status. “This is in recognition of the proven success of American players on an international level, the volume of players competing in adult tournaments, and the high standard of tournament organization and delivery at these events,” Nieder says. All information about the Miami Beach Tennis Cup can be found at www.itfmia.com.